Split. At the end of the last Split, Long Press Split to stop timing. 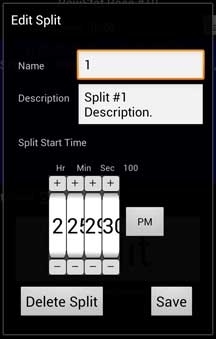 Press a Split in the list to Edit the Split, change the Name, Description, or Start Time of a Split. In the Split scroll list on the screen, you will see the previous Splits. 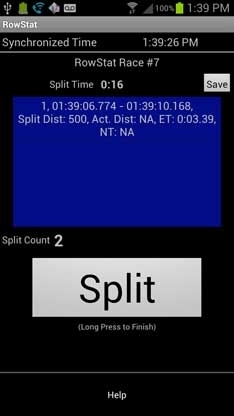 Each Split in the list shows the Split Number, Start Time, End Time, Split Distance, Actual Distance (if applicable), Elapsed Time, and Normalized Time. Normalized Time is the time it would've taken to go the Split Distance at the rate recorded in the Elapsed Time for the Actual Distance.This allows an easy way to compare performance, between several splits. Edit Split screen is displayed when you press a Split, in the list. Edit Split popup screen is displayed when you press a Split, in the list.